Before I get started, let me introduce myself. I'm Karen and I'm an avid reader. This is my first post here at 5-Squared and I look forward to many more! I can also be found at www.release-notes.blogspot.com. This grabbed me from the first page and took me on an incredible journey! I couldn't stop reading. The suspense was wonderful and the way the author wove the past and the present together were outstanding. It was one adventure after the next and you couldn't wait to see what was going to happen next. It was a complex and mysterious story with engaging characters. Dr. Monroe was a smart yet brave woman and rolled with the punches along with Brandt and his team. I really expected a woman who wouldn't hold her own with the rapidly changing environment but she was side by side with the team and her quick thinking came in handy. Seeing her own beliefs change in the face of mounting evidence really made her come to life! The conflict present in Brandt with his job duties and his religious convictions provided a depth to his character. 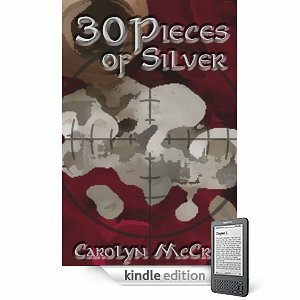 In addition, the author told an excellent biblical story and the ending left me stunned. It obvious that she really took time to make the past story as engaging as the present story. I think if you are interested in biblical history, you'd enjoy this book so much. I know that it's unlike anything I've read recently and that's good thing!! Hi Karen! I'm so happy to see your review today! I look forward to more from you as well. I like how you mentioned that "the way the author wove the past and the present together were outstanding." This makes it sound adventurous & intriguing! I'm glad you enjoyed it, Julie! I look forward to contributing more!